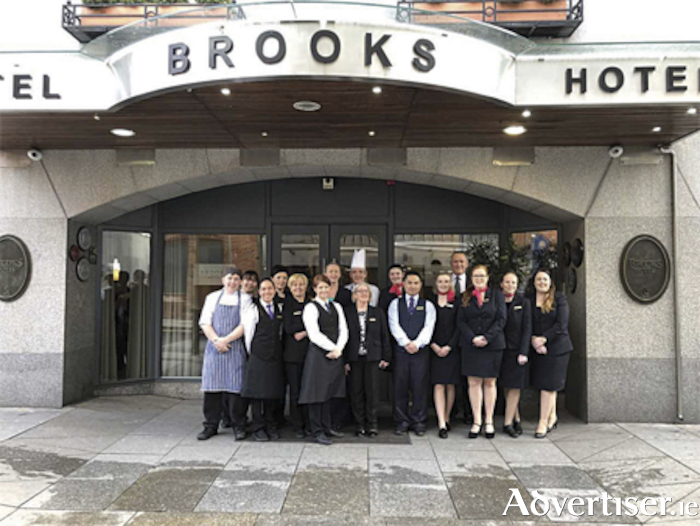 Owned by the Sinnott Family who previously owned the Connemara Gateway and Connemara Coast hotels, and live in Oughterard, Brooks Hotel is managed by Anne McKiernan, a GMIT graduate from Greystones who previously worked in a number of hotels in Galway including the Connemara Coast Hotel. Brooks Hotel is a member of the prestigious ‘Small luxury Hotels of the World’ Group and was initially developed in the mid 1990s. It formally opened for business with 72 bedrooms in 1998. Since then it has gone from strength to strength and in the process has won a number of national and international awards. In 2003, a further 26 bedrooms including three suites, a 26 seat screening room, Francesca’s restaurant and Jasmine bar were added. The hotel prides itself on its high standards and from the moment you enter this is evident with smiling staff clearly well trained and anxious to ensure their guests are well looked after. The fit out of the hotel is of an exceptionally high standard, as you would expect for an award winning hotel trading at the top end of the four star market. Bedrooms are fitted out to the highest standard with joinery supplied by the former Beola Crafts business at Roundstone, Connemara and much of the joinery in the public areas supplied and fitted by Calwood Design Studio, Curraghline, Sylaun, Galway. Brooks Hotel is situated in the fashionable heart of the city at Drury Street, an enviable location, just a three minute stroll from Grafton Street, St. Stephens Green, Dublin Castle and Trinity College. The Gaiety and Olympia Theatres are also nearby as are some of the best shops and restaurants Dublin has to offer, to name but a few these include, Louis Vuitton, Hugo Boss, Pamela Scott, Weirs, Massimo Dutti and Abercrombie and Fitch. Restaurants within a short walk of the hotel include The Ivy, Rustic Stone, Pichet, Marco Pierre White and Fade Street Social. Although situated in the heart of the city parking is not a problem with Drury Street municipal car park situated directly opposite the hotel. The hotel has negotiated special rates for its guests and there is an excellent car cleaning and valet service also available.